Cox, who lives near the corner of 7th and Washington in South Philly, is the founder of the Positive Mental Attitude Bike Ride aka the PMA Bike Ride, which seeks to deliver free pizza to the homeless across the city of Philadelphia. 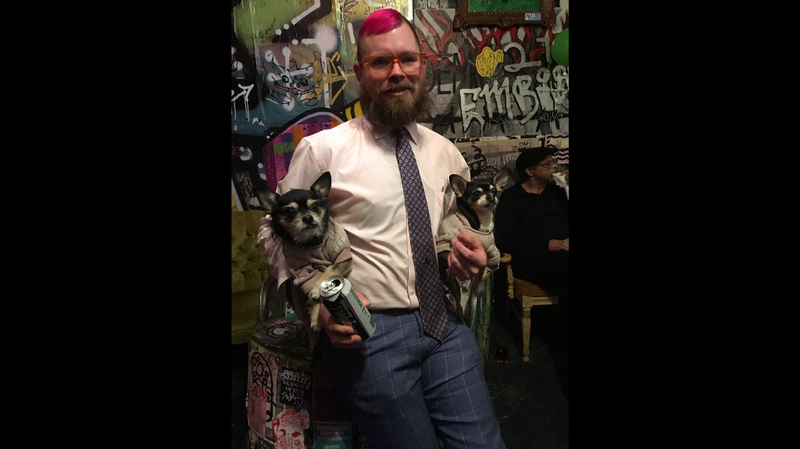 If you wander around the areas of Washington Square, Kensington — or really anywhere in Philadelphia — you might find a pink mohawked, bearded guy named Joe Cox riding a bike. The bike has a sign that reads “Make a Stranger Smile” and has a trailer connected to it, used to transport pizzas across the city. Cox, who lives near the corner of 7th and Washington in South Philly, is the founder of the Positive Mental Attitude Bike Ride aka the PMA Bike Ride, which seeks to deliver free pizza to the homeless across the city of Philadelphia. It’s an undertaking that’s helped feed at least dozens of hungry Philadelphians in need since its origination in June 2016. But in August, Cox announced an even bigger undertaking: he’s running for an at-large seat on City Council. Cox cites the city’s 10-year tax abatement and the $5.7 billion in tax breaks offered to Amazon as proof that local government is concerned more with protecting corporate interests than those of ordinary citizens. “Everyday people need to have a voice and need to have a say,” he said. One of Cox’s top priorities — and he concedes that ”some people think it’s funny” — is installing more public bathrooms in the city. At first, it seems like a clear nod to the many homeless Philadelphians he cares so deeply about. But Cox, who believes he’ll likely run as an independent, insists that public bathrooms affect everybody in the city. For many of his supporters, Cox’s dedication to the little people in the community is his biggest selling point. Supporter Meg Olkiewicz said that Cox’s “morals” set him apart from the crowd. According to Olkiewicz, other candidates simply don’t have the same connection to the community Cox has. Kensington resident Dennis Payne echoed that sentiment. Cox, who is 33 and has lived in Philly for seven and a half years, is a self-professed “progressive.” He said it was 2016 presidential candidate Bernie Sanders who inspired him to get involved in the community and openly run. In addition to Sanders, Cox also supported District Attorney Larry Krasner and state Rep. Elizabeth Fiedler (D-184th dist.) in their local elections. Cox knows he’s not like any of the other candidates, but he considers himself to be “very real,” and that’s the best thing he has going for him.